This Sharmeen Obaid Vs AKUH doctor fiasco needs no previous context anymore, everyone knows when and how everything went down. Sharmeen shared a note on her twitter earlier today to justify her stance and her previous tweets. 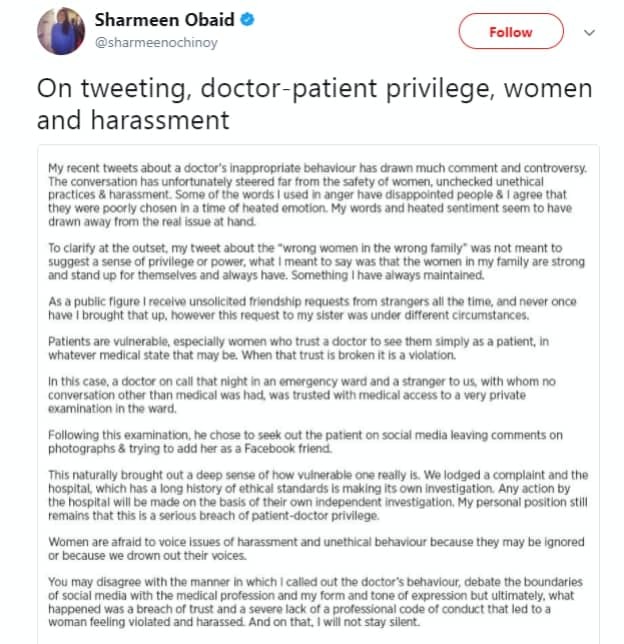 It is a general agreement that what the doctor did was unethical and unprofessional and can’t be justified as “alright” under any circumstances but the way Sharmeen Obaid handled the situation and especially her choice of words blew the whole thing out of proportion. While Celebrities like Ushna Shah and Mahira Khan supported her stance Hamza Ali Abbasi and Haroon Shahid disagreed, this lead to a massive media debate and still is catching more fire. Firstly Sharmeen agreed that her choice of words was rather poor and has lead people astray from the matter at hand, she further explained that her “wrong women in the wrong family” expression didn’t stem out of some wrongly placed sense of power or privileged-ness she merely meant that women in her family are strong and can stand for themselves. She went on to add that the examination that AKUH doctor conducted was of rather private nature after which he not only sent her sister a friend request but also commented on some of her pictures. It is a breach of trust and shows severe lack of professional code of conduct. She stated that all she did was voice her concerns whether that doctor stays at the hospital or leaves will be decided by AKUH’s own investigation team and she doesn’t have anything to do with that. So far the AKUH administration has given no updates on the development.